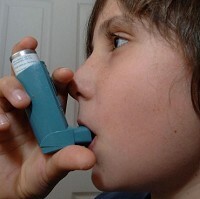 Asthmatic children are more likely to be readmitted to hospital within a year of being first taken into hospital with the condition if they are exposed to second-hand smoke at home or in the car, research has revealed. A study, published in the journal Pediatrics, suggests cutting down on exposure to tobacco smoke may not only reduce the number of hospital admissions of children with asthma, but also will help people wanting to give up smoking. The research underlines the importance of asthma travel insurance for children suffering the condition before jetting off on holiday. Researchers at Cincinnati Children's Hospital Medical Center and Penn State Milton S. Hershey Children's Hospital measured the levels of cotinine in the blood and saliva of more than 600 children. Cotinine is produced when the body breaks down nicotine, and helps scientists gauge exposure to tobacco. "The ability to measure serum and salivary cotinine levels presents the possibility of an objective measure that can be obtained when a child is seen in the emergency department or in the hospital and may be used to predict future hospitalizations," Robert Kahn, MD, MPH, associate director of general and community paediatrics at Cincinnati Children's and senior author of the study, said. "Such a measure for exposure to tobacco smoke could be used to target specific interventions at caregivers of those children before discharge from the hospital. Several interventions, including parental counselling and contact with the primary care physician, could be adopted in clinical practice." The research forms part of the Greater Cincinnati Asthma Risks Study, which aims to identify the cause of hospital readmission, especially for children in low income and minority households. The study examined children between one-year-old and 16-years-old admitted to the Cincinnati Children's Hospital Medical Center between August 2010 and October 2011. Levels of serum and salivary cotinine were taken during the time in hospital and their primary caregivers were asked about this child's exposure to tobacco. All the children were then monitored for at least 12 months to see if they were readmitted to hospital. While the researchers found no correlation between testaments of primary caregivers to tobacco exposure and readmission, they did find that children with measurements of cotinine in the blood and saliva were twice as likely to be readmitted to hospital than those that were not exposed.